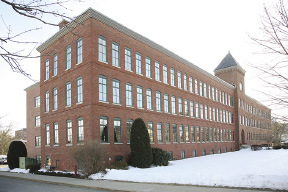 The U.S. Watch Company building on 260 Charles St., known now as the Howard Clock Building was constructed in 1886, placed on the National Historic Register in 1989, updated with a 35,000 s/f addition in 2000, purchased by Paradigm Properties in 2012 and modernized recently with full tenant improvement projects by Haynes Group. This 4-story 51,000 s/f brick and wood beam/steel joist building, is 2 miles from the Mass. Pike with ample parking and close proximity to all of the local restaurants and businesses in the downtown area. The real story, however, is in the transformation of the interior space to merge historic construction and character with updated architectural designs, lighting, finishes and creativity to attract a new generation of entrepreneurial businesses to the property. The established interior layout of small rooms, low ceilings and covered and painted surfaces was completely deconstructed to create large open spaces, abundant natural light and original ceilings that exposed structural members and mechanicals. It also offered tremendous opportunities for new creative design configurations. One of the challenges early in the project was that the demolition process uncovered bare floors, discolored steel beams and painted brick walls and ceilings that required cleaning and paint removal. A walnut shell medium was selected to sandblast 18,000 s/f of plank, timber and brick. Walnut shells are considered a "soft abrasive" and an ideal product for historical restoration due to economy, efficiency and environmental friendliness. Walnut shells clean wood, brick and metal without raising the wood grain or pitting the brick surface...and it is biodegradable. Once the structural surfaces were rejuvenated, each space was built out to the architect's specifications with added client customization with Haynes Group. 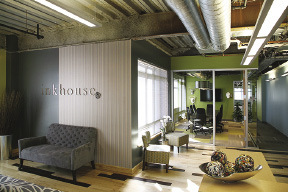 InkHouse, a public relations and social content agency occupies the 2nd floor of the building and their Haynes buildout of a Fusion Architectural design exhibits the full potential of this rennovated building space. InkHouse wanted to build a working atmosphere that was compatible with their collaborative and fast paced culture. To achieve this the company principals worked directly with their architect, Fusion Design Consultants, LLC, and Haynes Group, walking side by side through the property, making decisions on the spot to fine tune the project details to capture the character they were looking for. 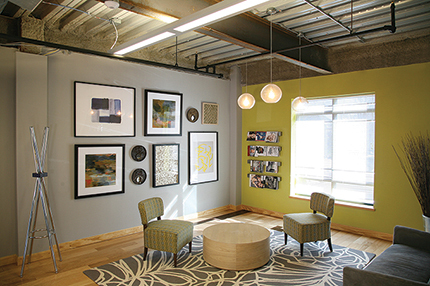 In doing so they transformed 11,000 s/f of a very typical corporate space with sheet rock and cubicles into open, creative work spaces and an interior design which Meg O'Leary, co-founder of InkHouse characterized as, "fresh, hip comfortable and fun". The design and construction teams also delivered an office layout that has full flexibility for conversion to other uses as the company grows and changes. 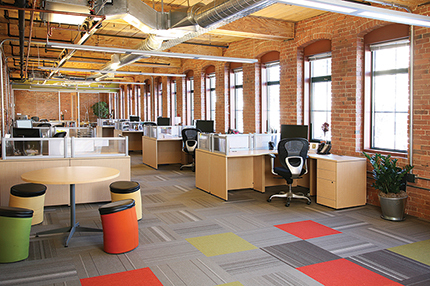 "Nothing is bolted down in our office" said O'Leary, who then put an exclamation point on the "fun" component of their culture, mentioning their Steelcase ergonomic stools that swivel, and adjust to height and the fact that they have scooters to go from one end of the office to the other that have bells to let people know when they are coming around a corner. Getting the details right is critical and O'Leary mentioned in closing that "Unlike our previous experiences, Haynes was diligent about making sure they completed the whole job and that every item on our punch list was crossed off." 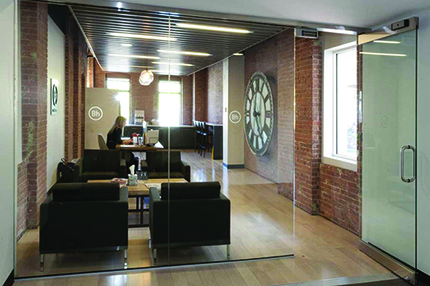 Boathouse Group Inc., an innovative advertising agency occupies a dominant 4th floor building location. Chris Boland a principal of the company was impressed by their IA (Interior Architects) design and their creative collaboration with Haynes Group. An example he cited was the repurposing of a large original clock from the building into their reception area rather than into the scrap heap. Haynes Group facilitated the reclamation and installed the piece that now adds a unique slice of nostalgia to the Boathouse experience. In addition to Boathouse Group Inc. and InkHouse, 2 other companies who have current leases in the property are, Commonwealth Informatics, a data extraction and analysis company and Lightwave Partners, a young, fast growing IT staffing company. Gregg Macomber, managing director at Lightwave Partners was clear about his team's desire not to work in "a traditional corporate setting". This 3,200 s/f 1st floor location is an ideal location for their next phase of growth, especially through their opportunity to work with Haynes Group for the customized improvements to the space. "There were three things that worked very well for us in our engagement with Haynes Group" said Macomber, "their partnership, their flexibility and there accessibility. They made a number of great suggestions and changes for us throughout the process and we never had a phone call or an email go unanswered." These businesses have bright young leaders who can help revitalize the local economy as one of the natural results of reinventing past industrial properties, and the unique designs and tenant improvements in these spaces are a drawing card for others. As Chis Boland of Boathouse said, "the great work that Haynes Group has done in bringing these designs to life makes other young businesses that visit the property want to join the party". With the success of the Charles St. project, Haynes Group has subsequently been engaged by Paradigm Properties in the new renovation of "RS/56" the old H.P. Hood property in Charlestown.